Leaves, leaves, leaves! There is one sure thing about the fall and that is there is no shortage of leaves! Every year I watch people rake up all of their leaves and either burn them or put them at the curb to be hauled off by the city. This is a resource that we should all be using in our yards, gardens, and flowerbeds. It seems very silly to spend all that time and effort collecting leaves from your yard just to get rid of them! And then on top of that, when spring time comes around, we will them go out and buy fertilizer and compost to put in our gardens! Leaves and grass clippings are one of the most abundant resources for a good compost pile that most everybody has (unless you live in the southwest, I suppose). 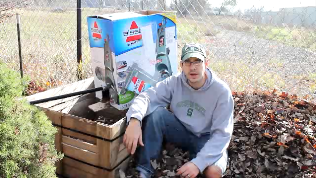 This post is not as much about how to compost but more about how to deal with leaves and how important they are to your compost pile or bin. Using leaves as the primary resource for you compost is important but it is not as easy as just throwing them into the pile and calling it a day. It is necessary to shred the leaves up as best as possible to prevent the leaves from matting down into a layer that will be hard to move and will not compost. What else is needed for the compost to start working? Well, the best thing to do is to add some nitrogen material such as kitchen scraps to get the process going. It is also necessary to turn the pile as often as you can to keep air moving around throughout. Even in the coldest months the pile will begin to compost although slowly. As the weather warms turn the pile more and more and by early summer you will have composted all of those leaves into rich dark soil. This soil is full of just about everything that your garden could possible desire. Another tip if you have a small yard, just offer to rake your neighbors' yards for them, they would love it and you will have rich garden soil in the spring! I normally run my lawnmower over the pile of leaves. If you want finer outcome then empty the bag and run the lawnmower over it again. repeat the process until you get the right consistency. It is quick and easy.